What is a corridor sign? Some call them a projecting wall sign or others may call them a hallway door sign. 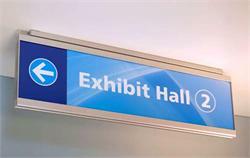 But a corridor sign is usually a projecting sign to mark a room, door or hallway and to give direction as you walk through any building or place of business. 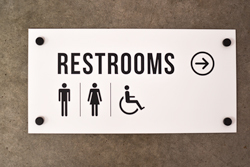 Building wayfinding signs or Building directory signs, door flag signs, hallway signs and wayfinding corridor markers will lead the way and help avoid confusion in your business, hospital or professional environment. Our 2-sided corridor flags, door flags and business directory signs install easily and are fully customizable with text, logos and more at no extra charge. 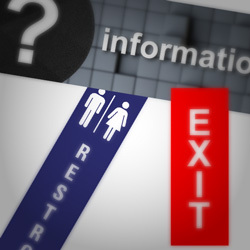 Show the way to any restroom, suite room or offices with our custom directional signs and projecting wall signs. 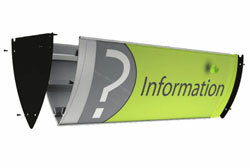 Can't find the building directory signs or wall projection signs you need on our web site? We design custom wayfinding solutions every day, simply e-mail us at service@officesigncompany.com or call us with sign questions, sign quotes or to request a digital proof of your vision. Free logos, arrows and custom text on all our office & directory signs. Send logos to artwork@officesigncompany.com or request a digital sign proof. 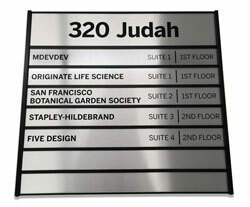 Need a custom building directory sign? 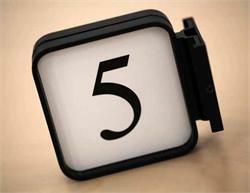 We can do that, chat with us today so we can make you and your next sign project a success. 2-sided projection wall signs with easy-mount anodized aluminum brackets. 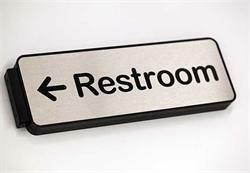 Custom wayfinding signs help avoid confusion in hospitals, schools and professional environments. Free personalization. 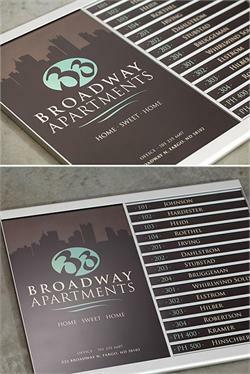 Custom building directory signs. Corridor room flags. 2-sided corridor signs have a rich black metal frame with easy-mount black anodized aluminum bracket that conceals screws. 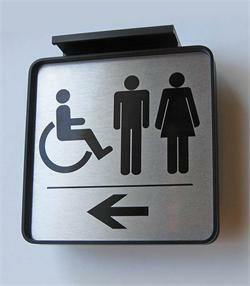 Directional wayward and hallway signs help avoid confusion in hospitals, schools or any professional environment. 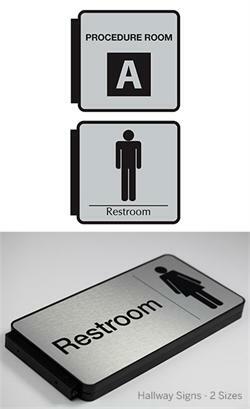 Silver metal 3"x 3" OR 6"x 6" corridor sign wayfinding sign. 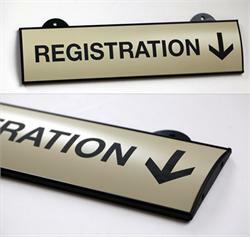 Two sided room flag sign with easy-mount satin silver anodized aluminum bracket that conceals screws. 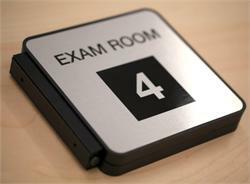 Directional signs and hallway signs help avoid confusion in hospitals, schools or offices. 2 sided hallway & corridor flag signs with black anodized aluminum bracket that conceals screws. 12"x4". Directional wayward signs help avoid confusion in hospitals, emergency areas and professional environments. Personalize with custom text at no charge. 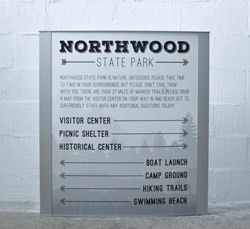 Gorgeous satin silver aluminum directory sign 11"W x 17"H main display area and 14 slots for custom directional messages. Removable clear lens areas allow for custom paper inserts. Measures 22.25"W x 17"H overall. Great for a hospital or hotel lobby. 2 sided corridor signs with black anodized aluminum bracket that conceals screws. 10"x2". Directional wayfinding signs and door flags help avoid confusion in hospitals and professional environments. Custom sizes available upon request. 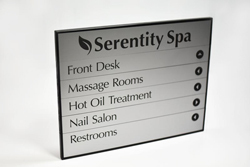 Directory signs with clear lensed window and removable name plates are the perfect option for displaying suites in an office building lobby, doctors on call, or any information that may change. Replacement inserts can be purchased separately as needed. 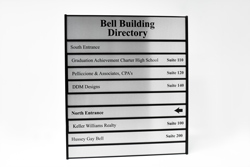 Engraved acrylic office directory and wayfinding signs are a tasteful way to show direction in your office building, medical facility or school. Signs are screw mounted and include decorative screw caps to enhance the look of the sign. Molded directory frames include laser engraved acrylic inserts that snap in and out making it easy to interchange information as needed. Choose from a variety of plate color combinations and sizes to best match the decor of your office or lobby. 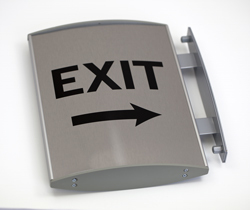 2 sided corridor signage with easy-mount black anodized aluminum bracket that conceals screws. 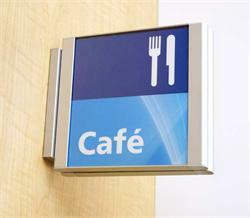 Directional wayward and hallway signs help avoid confusion in hospitals, schools and professional environments. 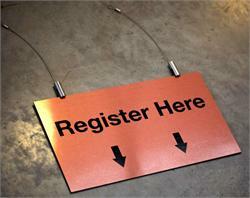 6 x 6 or 8 x 8 directional sign sizes. Custom hanging office signs and wayfinding signage. Hanging signage in various sizes - stock size is 16"W x 4" (in photo). Includes changeable sign insert and custom text personalization. Call, chat or email us for custom sizes, as well as color options. 2-Sided wood tone wayfinding signs, with custom black text. 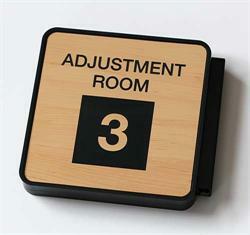 Ideal for Exam Rooms, Therapy Rooms and custom wayfinding solutions. 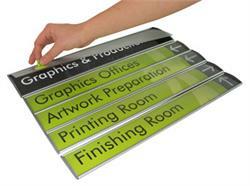 Make a lasting impression with professional office signs. Large directory sign with 18 slot insert areas for custom room names, business names, tenants and suite numbers. 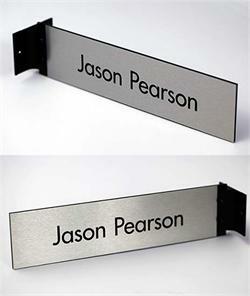 Black metal frame with removable & changeable nameplate areas. Free personalization - custom sizes and colors available upon request. 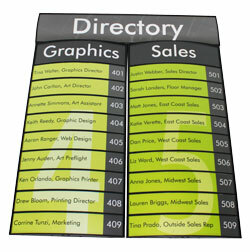 Large 20" wide directory sign with header plate and 7 insert areas. Black metal frame with removable & changeable nameplates. Free personalization. Create the perfect lobby directory for your medical facility, hotel, or office building. Large 20" wide building directory signs with header plate and 9 insert areas. Black metal frame with removable & changeable nameplates. Free personalization. 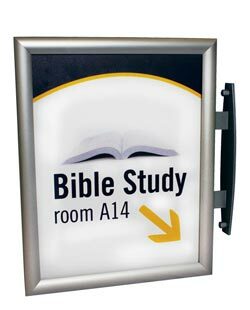 Business directory wayfinding signs for lobby, hospital or resort. Custom suspended ceiling sign. Hanging ceiling signage in various sizes (prices vary on size). Includes sign substrate, custom personalization (lettering), 1 pair of cables for suspension and stainless steel hanging links to connect sign to cables. 8.125" x 8.125" mini directory signage with seven easy-change inserts. Available in three brushed metal colors or white sign plates. Customized text at no additional charge. 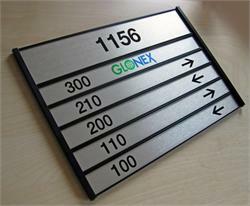 Directory signs and suite room markers. 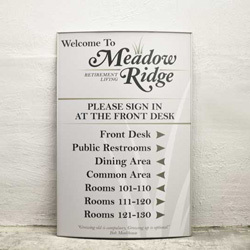 Full color insert for popular interchangeable sign system. Sign inserts are cut to fit the various-sized sign frames we offer and are easily interchanged by sliding them in and out of the clear acrylic holder. Triangular metal signs with two interchangeable panels can be mounted to the wall or the ceiling and be seen on two sides. Available in an anodized satin silver or a black powder-coated frame with black end caps in multiple sizes. Durable, full color inserts for Triangular Projecting Signs with flat interchangeable panels can be customized with any design, text or graphics you send us at no additional cost. Create attractive, directional inserts that can be interchanged as needed. 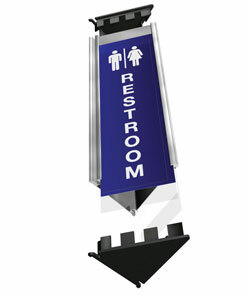 Metal triangular double-sided signs feature two curved interchangeable panels with a removable matte clear lens in each. 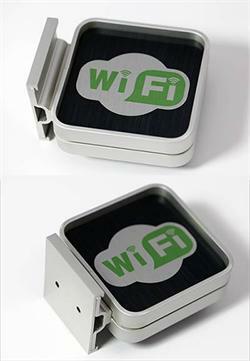 These are available in a black or satin silver frame with steel black powder-coated end caps. Graphics can be easily interchanged. 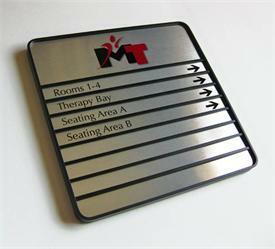 These sign inserts are replacement plates for our metal directory signs. Customize metal color, font style, etc to match your existing directory unit. 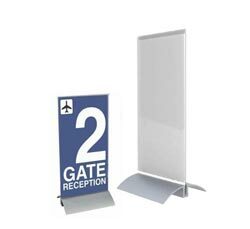 Full color insert for Triangular Projecting sign system, with removable clear non-glare lens. Sign inserts are cut to size to fit the various sized Triangular Projecting Sign Frames we offer. Our durable inserts are easy to change and easy to update. 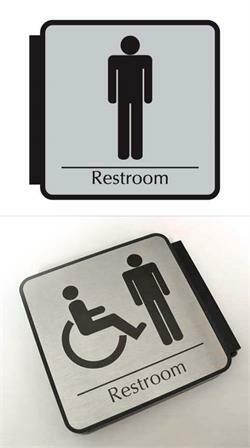 Interchangeable curved corridor signs include a metal frame in a satin silver anodized or black powder-coated finish with black or grey end caps and a non-glare clear protective lens. Remove the lens and interchange graphics easily. Multiple sizes. 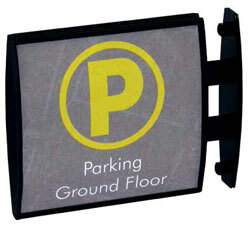 Aluminum projection mount corridor signs with top-to-bottom curve are interchangeable with the use of a suction cup. Remove the protective matte clear lens and change out the graphics. Available in satin silver or black finish with grey or black end caps. Outdoor durable metal directory frames with full color interchangeable inserts are a great way to display information outdoors or inside. Create your own custom design to send us or send us your information and we will create something for you! 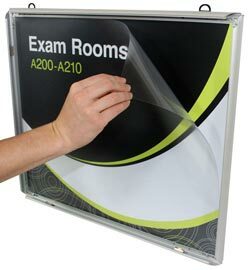 Popular projecting sign system, with snap open frame and removable clear non-glare lens makes graphic changes easy. Sign frame accommodates paper inserts. Corridor and hallway room marker signs project your message at 90 degrees. Full color insert for popular concave sign system, with removable clear non-glare lens. Sign inserts are cut to size to fit the sign frames we offer and are easily interchanged by sliding the insert and lens out of the sign. 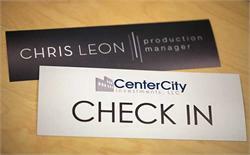 Full color insert for popular snap frame sign system, with removable clear non-glare lens. 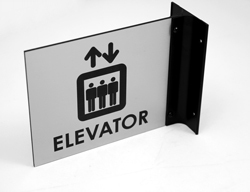 Sign inserts are cut to size to fit the various sized Curved Ceiling Sign Frames we offer and are easily interchanged with the aid of a suction cup. 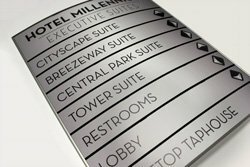 Curved Directory Signage - Interchangeable metal directories are available in satin silver anodized or black powder coated aluminum frames with black or grey end caps. Each panel is separate allowing you to add panels as needed or as your building grows. 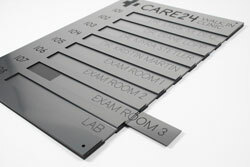 Multiple frame directories with interchangeable slots feature a satin silver anodized or black powder coated aluminum frame with your choice of black or grey end caps and divider strips. Easily interchange information when needed by removing the lens. Custom Building Directory Signs, Projecting Wall Signs and Wayfinding Sign Solutions for Business, Hospitals, Contractors and more. Corridor and Hallway Signs for demanding professionals. For Custom directory and hallway sign solutions call (701) 526-3835 or email an Account Manager or Service Professional at service@OfficeSignCompany.com.